and three were related to problems with access. Five of the seven dissection injuries resulted in emergent open conversion. In nonurologic laparoscopy, vascular injury appears to be less frequent and is usually associated with access-related injuries as compared to errors during dissection (Table 2). In a review by Usal et al., vascular injury was noted in 0.11% to 0.25% of laparoscopic general surgery procedures, and the majority of these injuries were due to trocar misplacement (12). Saville and Woods noted four (0.1%) vascular complications out of 3591 laparoscopic procedures and all were due to trocar injury (13). Another review of laparoscopic cholecystectomy and appendectomy revealed nine (0.07%) vascular injuries and all were due to either trocar or insufflation needle injury (14). In the gynecologic literature, vascular injury complicating laparoscopic procedures were reported in 0.68% to 1.2% of cases (5). Fruhwirth et al. reported nine vascular injuries during gynecological procedures for a vascular injury rate of 0.8%, and all were due to access injuries (15). Chapron et al. reviewed 17 reported cases of major vascular injury in the French Society of Gynecological Endoscopy, and 76% of the injuries occurred while gaining access (16). Of the four cases of dissection injury, three occurred during dissection around vascular structures. Like the general surgery experience, most vascular injuries reported by gynecologic surgeons were due to trocar-related events and not errors of dissection. However, Nezhat et al. reviewed eight case reports of vascular injuries due to errors of dissection, and four of the eight were associated with laparoscopic lymphadenectomy while three injuries were attributed to distorted anatomy (17). Vascular injury during dissection is the most frequent cause for emergent open conversion. The pneumoperitoneum should be maintained because this may decrease venous bleeding. It is essential in any laparoscopic procedure to have an open laparotomy tray open and available in the room in the event that emergent laparotomy is required. A comparison of nonurologic vascular injuries to that in the urologic literature reveals two important distinctions between the two experiences. Vascular injuries due to access-related events are present in all specialties, but the higher overall occurrence of vascular injuries in the urologic literature is probably due to a greater number of dissection injuries. ■ The greater number of dissection injuries in the urologic literature and select gynecologic reports are due to procedures that demand dissection around major vascular structures such as laparoscopic nephrectomy and laparoscopic lymphadenectomy. Although the rate of vascular injury is relatively low, these injuries tend to be the most common intraoperative complication (1,3,7,10,18,19). Vascular injury during dissection is the most frequent cause for emergent open conversion (3,7,9,10,20). Vascular injury during dissection tend to occur during procedures where dissection is required around large vessels as in laparoscopic nephrectomy or laparo-scopic retroperitonealymph node dissection (20), but are rare in cases such as laparoscopic prostatectomy where large arteries are rarely encountered. Guillonneau et al. noted only three bleeding episodes significant enough to require open conversion out of 567 laparoscopic prostatectomies (21). While this appears to be the trend, there are exceptions. In a multicenter study by Cadeddu et al. involving 157 laparoscopic radical nephrectomies, there was not a single vascular injury due to errors dissection (22). The majority of vascular injuries during urologic laparoscopy are due to errors in dissection. Most commonly, this is due to inadequate exposure of the vascular structure leading to either direct sharp injury or thermal injury to the vessel. The principle of dissecting from superficial to deep structures (from known to unknown) must be followed in order to avoid this type of injury. In addition, anatomic knowledge of the proximity of major vascular structures is essential to avoid inadvertent vascular injury. Disorientation during laparoscopic procedures can occur and has been associated with injury to the inferior vena cava (23) and the superior mesenteric artery (3). If the surgeon becomes disoriented during the procedure due to bleeding or unusual anatomy, it is best to visually scan the abdomen for available landmarks. If landmarks cannot be established, then consultation with a colleague may be helpful. If proper orientation is still unable to be obtained, then conversion to open surgery should be performed. Once a dissection injury has occurred, control of the bleeding vessel may be a challenge due to several factors. First, bleeding from a vessel quickly obscures the source because blood pools around the injured vessel. Second, the injured vessel is often not completely exposed because the dissection injury often occurs during exposure of the vessel. Third, unlike open surgery, the application of manual direct pressure is difficult, and depending on the laparoscopic instrument in the abdomen, the quick application of pressure to the bleeding vessel may be impossible. Once a vascular injury has occurred, an immediate assessment is required to determine whether an attempt at laparoscopic repair should be performed or if open conversion is necessary. If the surgeon is inexperienced, or if this is a case early in the learning curve, then immediate open conversion should be performed. 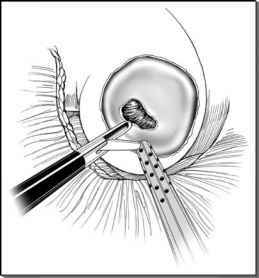 However, if the surgeon is more experienced and the necessary instrumentation is available, then a laparoscopic repair may be attempted. The first principle is to provide tamponade to the bleeding area with the available instrument that is in the abdomen at the time of injury. Additional ports may be required to provide exposure and suction as needed. The pneumoperitoneum should be maintained because this may decrease venous bleeding (8). Once the area of bleeding has been identified, further exposure of surrounding structures should be carefully performed to allow complete visualization of the region. After adequate exposure has been obtained, the area of injury may be identified and repaired either with intracorporeal suturing or by judicious placement of clips. On occasion, an injury may be repaired by firing a vascular stapling device (9). Failure to control hemorrhage by any of these measures, or the occurrence of hemodynamic instability in the patient, should prompt immediate open conversion. If bleeding cannot be controlled and is compromising operative visibility, then open conversion should be favored over blind application of vascular closure devices. The need for open conversion to control vascular injury appears to occur early in the laparoscopic experience of the surgeon. Meraney et al. noted that open conversion was required in three of their first four vascular injuries; however, three subsequent vascular injuries were controlled using laparoscopic techniques, and open conversion was not required to control vascular complications during their last 200 cases (9). Guillonneau et al. reported seven open conversions for laparoscopic prostatectomy in the first 70 patients, with three due to bleeding, but no conversions in the subsequent 497 cases (21). Thiel et al. noted successful laparoscopic repair of four consecutive venous injuries after open repair of the first (8). In addition to dissection injuries, vascular injuries have also been reported due to malfunctioning of endoscopic stapling devices. These injuries may be caused by application of the stapling device over previously placed metal clips on adjacent branch vessels. This may result in bleeding from the divided vessel due to lack of staple closure, or a jammed stapling device that cannot be easily removed from the vessel. Chan et al. reported 10 occurrences of stapler malfunction in 565 cases for an incidence of 1.7% (24). In 5 of the 10 cases, malfunctioning of the staple device was due to operator error with application of the stapler over previously placed metal clips causing the stapler to misfire. Others have reported similar problems with the endoscopic stapling device (3,7,25). There have been recent reports of major vascular injury due to inadvertent endoscopic stapler application across the vena cava (23) and the aorta (26). All injuries occurred during retroperitoneal laparoscopic nephrectomy. In one report, two patients suffered vena caval injury when the vena cava was thought to be the right renal vein (23). Both injuries were recognized intraoperatively with conversion to open laparotomy. Vascular surgical consultation lead to a successful outcome in each case. Disorientation of the surgeon due to unfamiliar landmarks was thought to contribute to ligation of the vena cava. Sautter et al. reported an aortic ligation during retroperitoneoscopic nephrectomy that resulted from application of an endoscopic clip in the renal hilum during bleeding (26). Limited visibility of the hilum was noted. The patient presented postoperatively with neurologic symptoms, and complete occlusion of the aorta was diagnosed on angiography. The occlusion was successfully bypassed with an aortic tube graft. These cases demonstrate the importance of remaining oriented during laparoscopic procedures, especially when bleeding may obscure the operative field. Access-related injuries to abdominal viscera or retroperitoneal vascular structures are estimated to occur between 0.05% and 2.8% of laparoscopic procedures. While these are rare injuries, when they do occur, the consequences can be devastating with a mortality rate reported from 5% to 13%.